The Knitting Runner is a designer/artist, college professor, and family man. What started as a, 'what if I can?' question turns out to be a great combination. Honoring Susie Hewer's fundraising for Alzheimer's Research. David C. Babcock is 41 years old. He is a husband of 18 years and father of 4 young children. 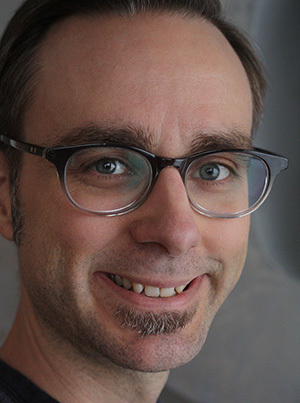 Mr. Babcock is a Tenured Associate Professor of Graphic Design at the University of Central Missouri in Warrensburg Missouri. 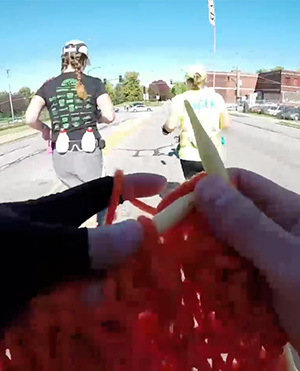 Knitting while running is his performance art and fundraising project. David started exercising in earnest at age 38 after recognizing the toll of pending middle age on his body. Running helped him drop 11% of his body weight and relieved symptoms of asthma and seasonal allergies. David found that running in minimal shoes helped minimize knee stress and allowed for a smoother running gait. With less bounce while running it is possible to drink and do other things while running. He first tried crochet toys but the small scale and ever-changing stitch count proved impractical. David found that knitting worked better. After many experiments he settled into making small nylon bags with circular needles. It takes a lot of time to do distance running and it takes time to knit. By putting the two activities together the time passes easier for both activities. It takes his mind off of the endless miles and makes knitting an active pursuit. David wondered if other people were as crazy as he was and soon found Susie Hewer's blog. Susie Hewer was the first to set the Guinness World Record for knitting while running a marathon. She knit and ran to raise awareness and funding for Alzheimer's research in the UK. In honor of Mrs. Hewer, and her record, my Guinness record was done in support of the Alzheimer's Association Heart of America Chapter here in the U.S. There have been many recent advances in the early detection and care of people with Alzheimer's Disease. By supporting the Alzheimer's Association you can help to keep the focus on finding an end to Alzheimer's. Don't wait until you are affected personally to show your support. 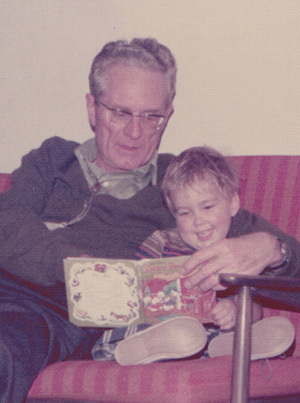 My Grandfather suffered from Parkinson's disease related dementia in his last years. Let's fight to keep our loved ones "with us" while they are still with us. This year David's main Alzheimer's fundraising will be for the New York City Alzheimer's Association in connection with my running the NYC marathon in November. Please make a donation towards his fundraising goal here. Do you have an idea for an Alzheimer's fundraising event where you think I could help? Write David an email.